New Fortunes - Rolling Out The Barrel. If there is one natural material that can truly be associated with the history of brewing, it has to be wood. So important was this natural resource that it played a part in nearly every stage of the brewing process, from mash tun to copper through to the fermentation vessel and finally storage. Its great attribute was strength and durability allied to the fact that it was relatively easy to repair. The image of the Cooper plying his trade is as synonymous as brewing itself. But this said there is one aspect of the brewers art that gets scant reference through the plethora of brewing historical literature, and possibly the most important of all - the barrels in which the finished product was finally stored and served. If a barrel was to be used for storage or serving beer it had to have one important quality, to be completely devoid of flavour or taints. So how did the brewers go about achieving this? One book that did address this question was 'Brewing Theory and Practice by E. J. Jeffery'. Originally published in 1947 during the post war period when resources were severely limited in Britain the book acted as as Brewers go to of all things practical. 'Good casks are intended to last for many years, and were at one time made from the best Crown Memel oak, a wood grown in the Baltic district. No other timber in the world is so suitable. During world war 1 an intensive search was made to replace the wood which was then unprocurable , but the irregular grain and large number of knots present in English oak rendered it unsuitable, because it was impossible to work or bend. 'Ash was tested but was found to give a flavour, and no other wood was found to be of any use at all. Chestnut did serve a stop gap, but proved very soft and undurable. Of foreign timber, Persian oak proved to be workable, but varied considerably in quality. Some were intensely hard, and transmitted both colour and flavour to the beer. Oak of fair quality and good grain is also procurable from the Danube district, but is softer and more open grain than Memel oak. It is therefore reserved for export casks only, since the latter are used for beer on the outward journey only. Thereafter, less particular purposes await them. 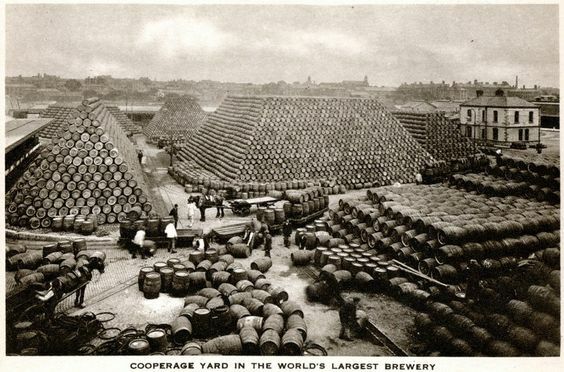 During World War 2, casks were successfully made both from English and American oak, and a start was also made from resin-bonded veneer ('plywood') casks on the line of a successful pre-war German experiment'. 'When the new casks have been passed and accepted as correct, it is necessary to subject them to a curing and seasoning process before they can be passed into use. Otherwise in a raw and unpickled state they would not only impart a black tint to the beer, but would also transmit a very woody flavour. The best method is to disolve 14lb. of salt and 7lb. of soda in a kilderkin of boiling liquor. Half a gallon of this solution should be added to each barrel of 36 gallons, and then it should be filled with liquor at a temperature of 160 Fahrenheit. This figure should not be exceeded, otherwise it will be found that many staves will have cracked across. 'After this, a good washing out with hot water and steaming should make the cask ready for use. It is always advisable to fill it for the first time with stout or porter, if possible, as this drink will not be so adversely affected by colour or flavour, should traces of either remain. On no account should a delicate pale ale be put into a new cask for its first filling'. the scale and importance of the coopers art is well illustrated here. 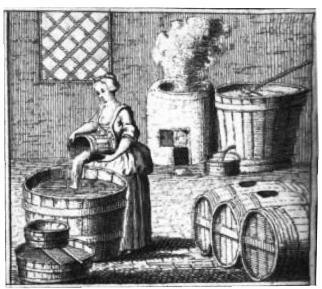 An illustration of past domestic brewing showing nearly every stage involving wood. Eventually stainless steel for brewing kit and aluminium for barrels became the trade norm being easier to clean and maintain, and in the latter case, lighter and more durable. But, for some regional breweries the wooden barrel continued to be used, more as a symbol of tradition rather than of function. So whilst it would appear the wooden barrel was fated to become a relic of the past in fact something quite unseen has happened!